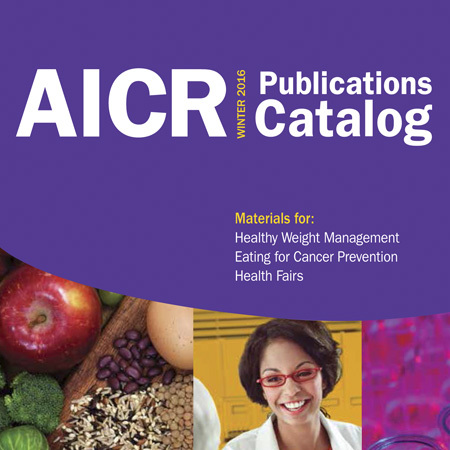 AICR’s publications provide clear, easy-to-understand, unbiased information drawn from the latest research on the relation of nutrition, physical activity and weight management to cancer risk and survivorship. Brochures and Health Aids -- Brochures, pamphlets and tools offering practical information on cancer research, healthy eating, lower cancer risk and cancer survivorship. Order in bulk at special reduced pricing. Request single, free, printed copies. AICR Newsletter – Get our our quarterly newsletter by mail. Subscribe now, or request your free sample. ScienceNow – A quarterly newsletter on diet and cancer research for the general public and health professionals. CancerResource – Free information handout for newly diagnosed cancer patients to help both during and after treatment. A Dietitian’s Cancer Story – by Diana Dyer, MS RD – This book provides inspiration for recovery and healing from a three-time cancer survivor. The Estate Planners Corner offers special AICR services related to charitable giving. Request publications for attorneys, financial planning professionals and investment advisors.